GPI is headed to CamaroFest! We can’t believe CamaroFest 8 is already almost here! We’ve been a proud sponsor of this event for several years, and are proud to continue our partnership in 2018. We will be headed up on the 12th to get our booth set up, and coming home on the 15th. Since a big part of our team will be there – online orders may be delayed a few days. We’ve kept you waiting long enough!!! 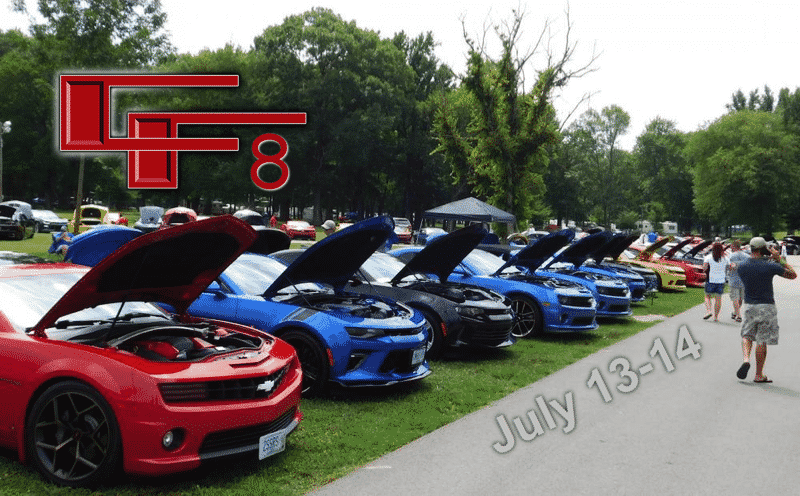 At long last, we’re able to announce that this year’s event, CamaroFest 8, will be hosted at Beech Bend Raceway in Bowling Green, KY. Yes, we’re going back! Last year’s event was the biggest we’d ever had…and the city, track, hotels, and everyone else involved are the most energetic, welcoming people we’ve ever dealt with for one of these events. That all said – we’ve got several big improvements we’re working on this year…and some other tricks up our sleeves! The dates are Thursday, July 12 at NCM Motorsports Park for the Road Course, then on Friday, July 13 – Saturday, July 14 we’ll be at Beech Bend Raceway for the main event! Camaros of all generations are encouraged to join the festivities. Firebirds and Corvettes are also welcome to attend!! — Drag Racers will utilize Beech Bend’s ¼-mile length drag strip for bracket racing, heads up racing and informal passes; and awards to the fastest cars in competition. — A unique “CamaroCross” competition features an adapted autocross course suited to the high-power, rear-wheel drive Camaros; with awards given to not only the fastest drivers, but also some other “special” people. — A multi-generational Camaro Car Show pits 200 of the cleanest, and best designed enthusiast-owned cars in a competition of style; with awards in several different categories. — The National Corvette Museum Motorsports Park, one of the newest and most technical road courses in the Nation will be used for enthusiasts eager to test their skills at a HPDE, operated by Hooked On Driving. — Meet and Interact with members of the Camaro Team, from Chevrolet, and an up-close look at different vehicle displays. — Visit with event sponsors for consultations, sales, displays, and select on-site installations.We have seen attendance numbers peak higher than 1000 cars, and even more people. It’s an incredible sight to see…that many Camaros literally “take over” the town that we’re in. You can’t go to a gas station, restaurant, or convenient store, without running into another Camaro out on the road. And just a reminder to all those “lurkers” out there – YOU can come, too! GPI’s Ryan Stevens Sets New SBE NA 5th Gen Camaro Record! Announcing the GPI Rewards Program!